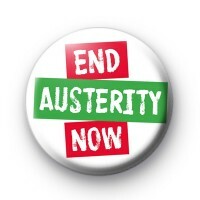 Red, green and white End Austerity now support badge. If you are against the deep austerity measures & cuts taking place in the UK you can show your support with this End Austerity Now badge. Hand made in our Uk workshop. Standard 25mm button badge. This badge is a political statement, ideal for socialists, labour party supporters, green party supporters and anyone against austerity measures.